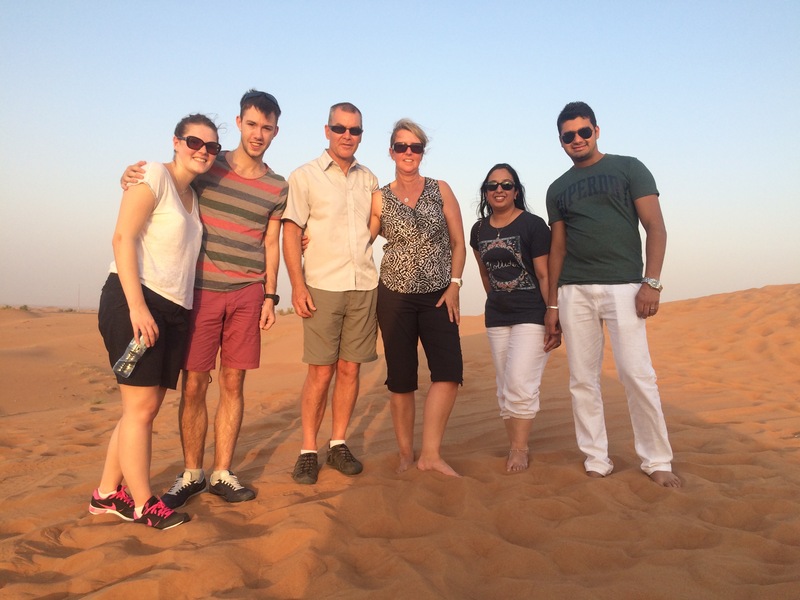 We booked the desert safari through the concierge at our hotel who ensure it was one of the best trips. We were picked up at the hotel at 3pm by a very swagger looking guy dressed in the White Dubai national outfit and his Louisvuitton shades on! 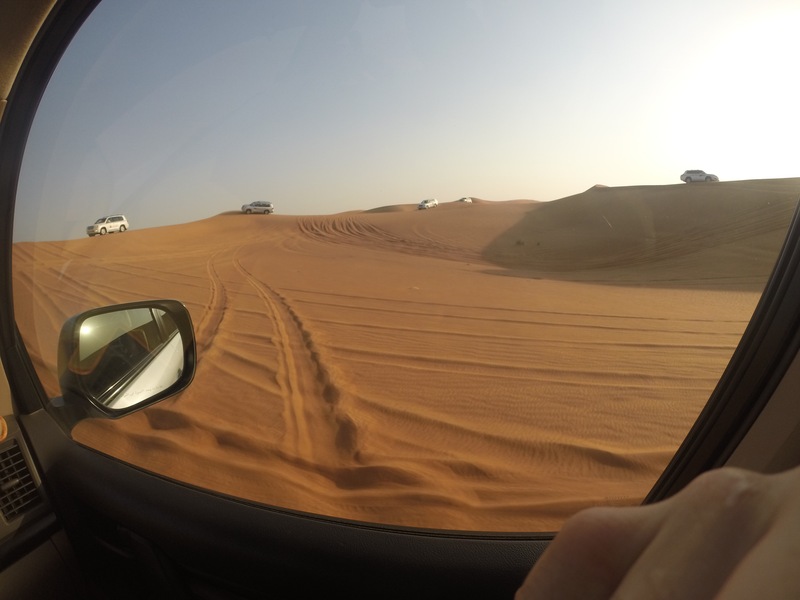 We drove away from the hustle and bustle of busy Dubai into the dessert close to Oman, our first stop was a quad bike sand track! 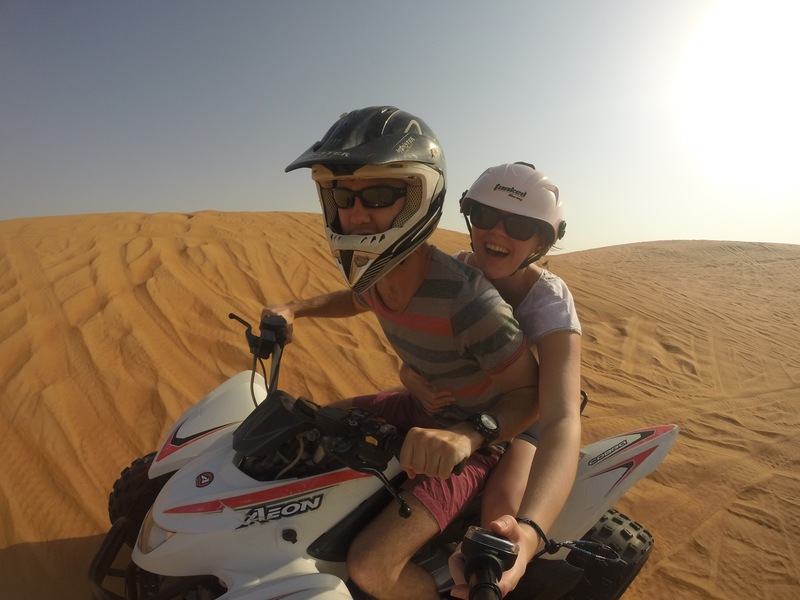 And of course Conor wanted a go, we both hopped on the quad bike and we had the large fenced sand dunes area to explore, we had 30 minutes to enjoy! 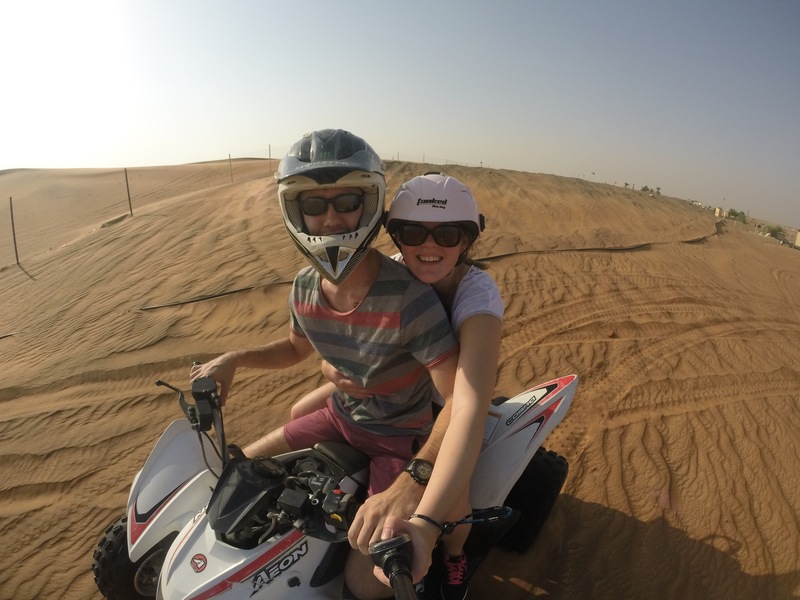 I really enjoyed it on the quad bikes until Conor took a corner a little too fast and implanted us into the wire fence, we were both fine but I took the opportunity to get off and let Conor fly around alone. From the quad bike area we crossed over the road onto the real sand dunes where we were joined by about 30 cars and we set of in a convey to hit the sand dunes. It’s a good job I knew this guy had been doing his job 18 years because it was scary, we flew up and down the sand dunes each car really close to one another but we finally made it to the end with no near misses. 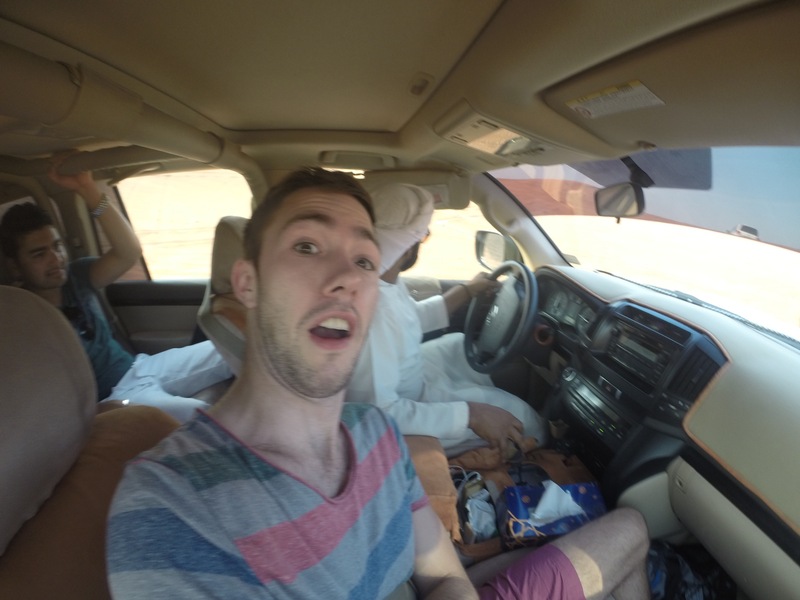 We arrived at the camp in the middle of the dessert where we were greeted by camels, our guy took us into the compound and showed us all there was on offer from henna tattoos, shisha pipes, dressing in traditional outfits and camel riding! By the time we’d had our quick tour of the area the queue for the camel riding was massive and we didn’t get another chance which was a shame but at least I can say I’ve done it once in Morocco! 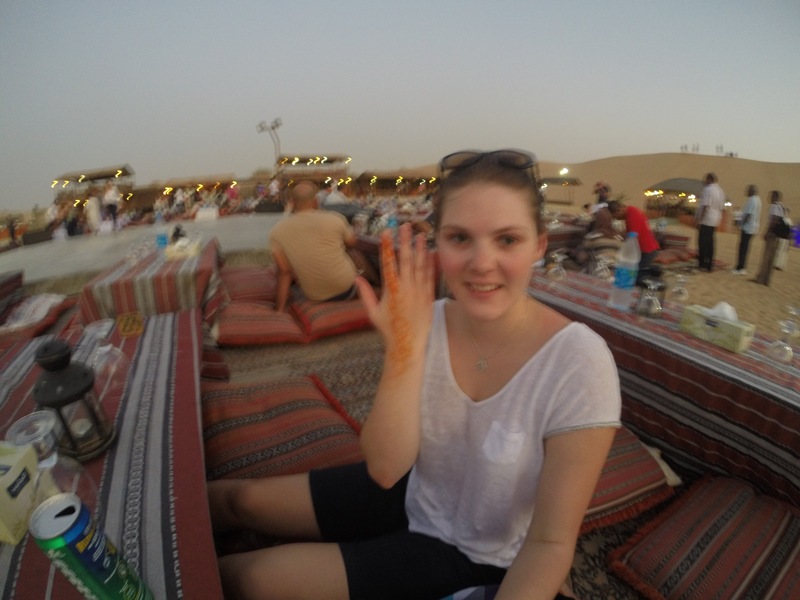 I headed straight to the henna tattoo tent with Conor in tow, surprisingly he didn’t fancy any henna. There were about 5 ladies waiting before me in the queue but the henna tattooist was so fast that it was my turn in no time, she literally took about 2 minutes on each person, I’m sure she did the same design on everyone. As the sun set, we were all assigned certain tables to sit at, no chairs provided of course. It got pretty crammed around our table with 6, Conor and I (English) an Ozzie couple and an Indian couple! It was really good to chat to them all and the Ozzie couple had some good tips for us when we arrive in Australia and even said to nip in to say hello to them if we were passing! At 7pm a tandem dancer from Egypt came on the stage, which was at the centre of all the tables and began a 15 minute dance with the traditional outfit on. 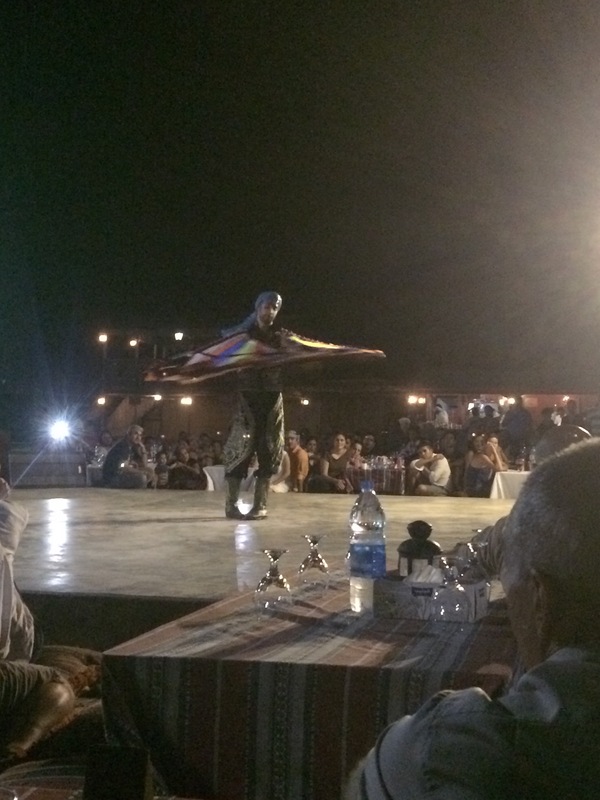 We then had a belly dancer on stage who performed another 15 minute show! By that time we were both starving but we were not disappointed with the buffet provided, it was amazing! 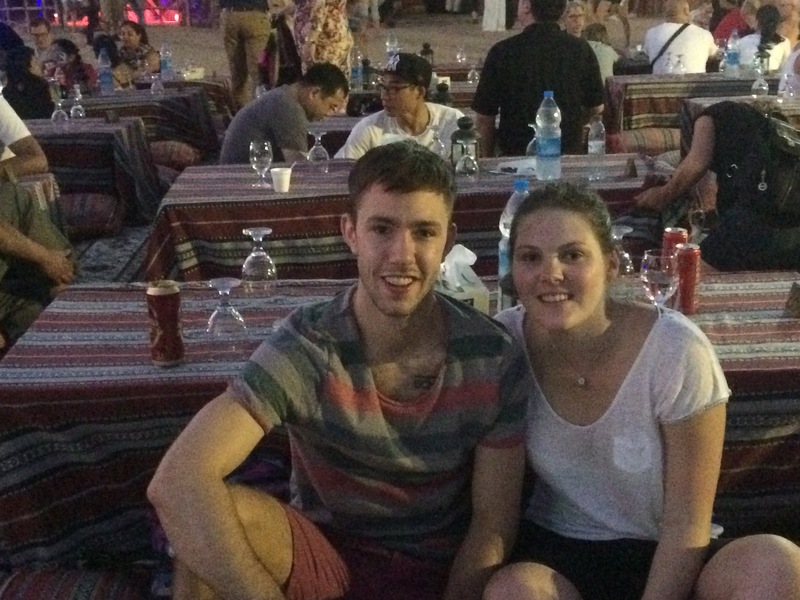 There was kebabs, salad, curries, nan bread, rice, fish and it was all delicious! 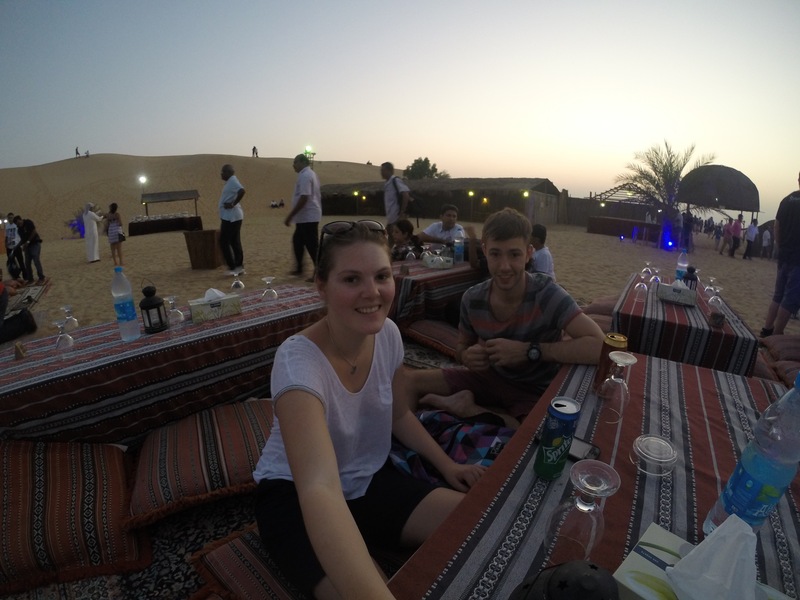 After the food we headed back onto the sand dunes for a short distance and back onto the highway to Dubai. It was a really good day out and well worth the money, it cost around £40 each which included dinner, we did have to pay extra for the quad biking which was nearly as much as the trip but we both enjoyed it!